CrossFit Whistler - Latest Gym Fuelling on Infinit!!! Infinit is still a new player with respect to nutrition for CrossFit and with all the choices out there I understand the scepticism when we make initial contact with a club, would imagine box owners are inundated with companies that think they are the right fit for a club. When we are actually able to have a conversation with an owner or coach on what they want from a nutrition program and what we offer the, conversation goes really well. That is exactly how things went when Jordan Glasser and I first talked. Jordan is a Level 2 CrossFit Trainer and owner of CrossFit Whistler. From the onset of our first call, I learned immediately that Jordan was very knowledgable about nutrition and most importantly how nutrition can really support the CrossFit athlete. Many of the products on the market only stress the need for protein, we have almost apologized for it, when we tell people there are carbs in our X-Cite and Rescue blends. When I told him that we have a 2:1 Carb to Protein blend and that we believe carbohydrates are a necessary requirement in supporting full recovery, he was completely aligned. Jordan states: “I am part of the Crossfit community because they have defined fitness, challenged it and continue to mold the program that I teach today. Oh, and it produces far and away the best fitness results on the planet!” Jordan came to CrossFit after being competitive in other sports and going through re-hab a couple of times post-injury. He has coined a phrase that makes a lot of sense "Pre-Hab", CrossFit puts you in this state one that makes you strong and healthy so injury is prevented. This is a neat perspective. We are very excited to have CrossFit Whistler on board as the list of boxes fuelling on Infinit grows. Having someone with Jordan's knowledge and passion about the sport chose our Strength Program is a big deal to us! If you are lucky enough to find yourself in Whistler - check Jordan and the Team out, they have a great thing going. Incredible that we are near the end of another year. The end of the year is a chance to reflect, celebrate accomplishments and set goals for next year. For me personally it has been a great year, I am grateful for the continued growth of Infinit, my friends/family and personal accomplishments made in Mtn Biking and my introduction to CrossFit. Fitter and stronger than I have been in years I come into 2015 ready to take Infinit to another level. I am grateful for all of the partners and customers we have. I hope you enjoy the holiday season and look forward to supporting your goals in 2015. Be safe and Happy Holidays!! Ok before we get going, did you know there is a Mountain Bike Dictionary? I do now, well at least it is a glossary and in it you will find the term betty, which refers to any female mountain biker. Check it out: Mountain Bike Dictionary. Was introduced to Melinda Davie recently after partnering with Steve Neal and Andrew Randell of the The Cycling Gym, she is one of the leads of the all women's club. and the Crank the Shield - at both I saw their presence. They have a team of racers and a group that comes together weekly to have fun, challenge one another and to just get out there. We are excited to get the feedback and exposure from the group as they progress in 2015 while fuelling on Infinit. For each of the club members we are doing an individual nutritional consult, here we will work with each athlete and create a formulation that matches their body characteristics and riding style. All members will receive discounts and the Race Team will receive a deeper discount. 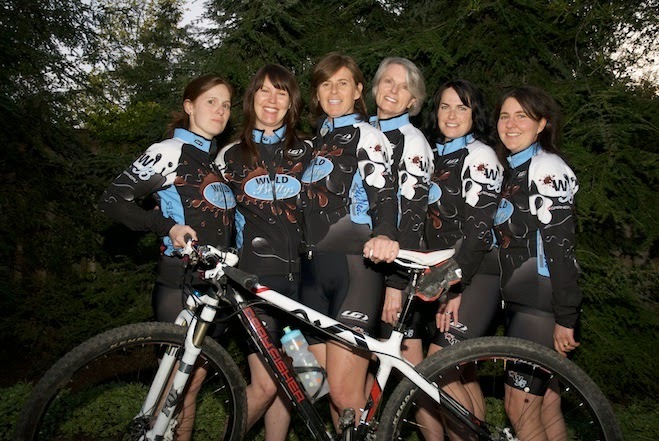 At any event that the Bettys are racing you will see their tent, you will also get a chance to sample an Infinit blend. I've been using infinit for a couple of years now and love the way I can customize it for my long training rides when I prepare for stage races. I am so excited to share with the Bettys! - Melinda Davie. We are really looking forward to our new partnership with the Wild Bettys, believe it will be mutually beneficial for sure.